This hike takes you to a series of little lakes nestled below the awesome cliffs of the Sawtooth Mountain ridge. The trail head is along Forest Road 8410. The trail begins in a relatively open area and gently takes you to a more heavily forested area just above the first lake, Pothole Lake. 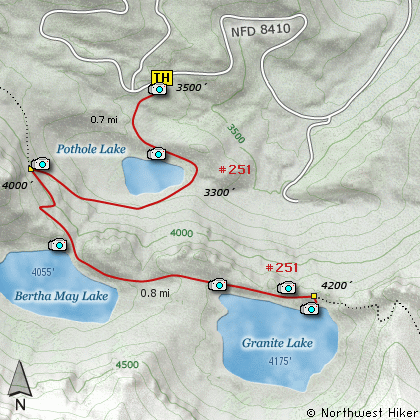 The trail descends to the outlet of Pothole Lake, then crosses on rock stepping stone before beginning a serious climb to the next lake, Bertha May Lake. The trail gets a bit steep at times, but is well switchbacked. It is only a short 3/4 miles from the trail head to Bertha May Lake. The trail then crosses the outlet to Bertha May Lake over a once fine bridge, and heads southeast toward the last of the three lakes, Granite Lake. The trail gains elevation before reaching Granite Lake, then descends to the outlet of the lake with another stream for crossing the lake outlet. There are occasional views of Mt Rainier on this hike. No view of Mt Rainier is poor, and these enhance the value of the hike. Pothole Lake is more like an overgrown pond, but Bertha May Lake is more like an high mountain lake, surrounded by cliffs. Granite Lake is the largest of the 3 and is a great destination for a day hike and lunch. From Ashford travel east on highway 706 for about 2.3 miles. Turn right (south) onto Kernahan Rd East which will become Skate Creek Road. This road is also designated as Forest Road 52. Follow FR52 for about 4.7 miles and you will come to the junction with Forest Road 84. Turn right (south) onto FR84 and follow it for about 1.4 miles until you come to Forest Road 8410. Bear right (uphill) on FR8410 and follow this road for about 3.9 miles and you will come to the trailhead for this hike. Be warned that the last mile of travel on FR8410 has monster water bars which are only managable with verhicles of eight inches or more of ground clearance.